The ancient Romans were pioneers in the field of pool design. No, their public baths weren’t quite the same as a modern pool with saltwater chlorination, variable speed pool pump, and attached perimeter overflow spa. However, they deserve credit for the idea of the modern swimming pool, as well as many of its early innovations. The influence of the ancient Romans is still being felt today, most notably with the popularity of Roman-style pool design. However, it’s safe to say that most people who choose this type of pool aren’t thinking about ancient history. They’re thinking about the stately beauty of this upscale pool design. What is a Roman-Style Pool? Roman-style pools are also called Grecian-style pools, Roman/Grecian pools, or various similar combinations. They may also be referred to as formal pools, geometric pools, or Roman-end pools. As is often the case in pool design, some people may attach different meanings to each of these terms, while others use them interchangeably. The defining feature of Roman-style pools is their shape. At their core, they’re rectangular, but with cut corners, sharp accents, and more often than not, at least one semi-circular end. The Roman end is particularly popular, and is typically the location for steps, seating, or a shallow tanning ledge. A semi-circular Roman end often serves as an entry point into the pool, with steps and/or seating. There’s more to Roman-style swimming pools than their shape. Just as a lagoon-shaped pool screams “tropical oasis,” a Roman/Grecian pool shape suggests a classical setting with elements like columns, pedestals, and statues. Naturally, they also integrate perfectly with homes in the neoclassical style (though they look amazing just about anywhere). As for the pool deck, the choice that immediately comes to mind for Roman architecture is marble. However, while a marble pool deck is hard to beat in terms of opulence, it’s easy to beat in terms of price. Travertine is a more economical choice for a Roman-style pool, and has many other advantages as well. Another good option is to highlight the pool’s palatial elegance by using little or no decking at all. There are downsides to having grass around your pool, but the aesthetics are undeniable. Here’s a Roman-style pool with minimal decking and a privacy hedge. Does it get any classier than this? All that beauty comes at a cost, and we’re not just talking about the construction bill. There are some disadvantages to choosing a Roman-shaped pool to weigh against its obvious appeal. The irregular shape is the main hitch, as it limits the pool’s usable area. If you have plenty of space in your yard, giving up a couple of feet to a cut corner or rounded end might not trouble you. However, if like many people, you’re trying to maximize the area you have to work with, choosing such an inefficient shape isn’t going to help. Also, Roman ends present a problem for people who like to swim laps. For one thing, they often mean a shorter pool, requiring more turns. 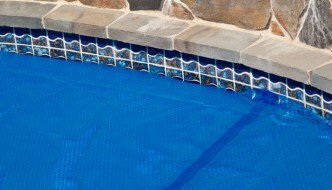 But even if you lengthen the pool to compensate, the steps or shelf on these rounded ends aren’t ideal for kicking off. For many people, those issues are minor compared to the gobsmacking beauty of a Roman-style pool. That’s why this type of pool is popular with homeowners, and likely will be for another two thousands years or so.